Consumers are just beginning to consider smart house features. New homes can be easily upgraded to add various smart house features. WiFi thermostats, cameras, alarm systems and auto door locks are just a few examples. But is it worth it? Does the money you spend provide sufficient pay back or peace of mind? This is what many consumers are thinking about. Turns out ir really depends on your life style, your wallet, interest in technology and of course the value of your possessions you are trying to protect by alarm systems. WiFi Thermostats – a useful tool if you need to monitor or change your temperature settings while you are away from the home. Consumers who travel a great deal will appreciate being able to check on your homes temperature remotely and also make adjustments. Many will also send alerts based on your specifications. Camera Systems – monitor your home while you are away and can provide alerts as well as evidence if intruders enter your home. These systems can be expensive. Lighting Systems – automated lighting systems are probably the most useful when it comes to making your home look like someone is home. They are also inexpensive. Alarm Systems – unmonitored systems are useful along with tags on windows to deter thieves. A monitored system will alert the alarm center who in turn will call you and the police. False alarms can be expensive if the police are dispatched. Have the system call your cell phone and then check cameras for intruders can be more useful. Auto Door Locks – hand with young kids who are leaving for school and forget to lock the door. Can be expensive. Many of the above systems can be combined into one monthly rental cost. However you need to evaluate the benefits vs. the cost before proceeding. Intelligent WiFi thermostats are just one small part of the emerging smart home trends WiFi Thermostats subject that we want to discuss. 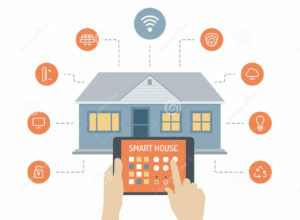 Smart homes involve many different aspects. Security, environment control, comfort, and control of everything in your home from your smart phone or desktop. We recently installed a new furnace and AC system with a WiFi enabled thermostat. This is an initial step towards a smart home. We can now control the homes environment from our smart phones from pretty much anywhere. As long as the in home WiFi is working and we have internet access to our smart phones we are good to go. Using the app on our phones we are able to turn on or off the system. We can adjust the temperature in the home. We can also turn the fan on auto or always on. This capability gives us lots of flexibility to control our homes environment. Sometime in the future we will integrate the thermostat with other smart home capabilities. We will do this when it makes sense from an economic perspective. The WiFi thermostat was added simply because we were upgrading our AC and furnace, so we decided to upgrade the thermostat at the same time. A good deal for us and a practical smart home technology. A smart thermostat like the one here can give you peace of mind and might even save you some money. Note we are not promoting this particular thermostat in our guide to smarter cooling of your home. We just used the picture to indicate that these types are available. A smart thermostat should allow you to program various temperatures throughout the day, it should have WiFi allowing remote connections to read and make adjustments and it should also learn your habits so that it will automatically adjust the temperature of your home during the day. The really smart ones will even shut off your heating or cooling system if they detect that a window has been left open. The question is, “do you need all of these features and will you use them”? We think that once the novelty has worn off, that most consumers will ignore their thermostat. They will program it the way they would like the temperature in the house to be and then forget it. They might check once and awhile online over the internet using their smart phones. Unless they are away for an extended period of time, they will likely never access their smart thermostat again. If you are paying a premium for the thermostat, you are wasting your money in terms of using all of its functions. make sure that you can set different temperatures during the day and that is generally all you will need. Unless you are going to access the thermostat from over the internet, it is just not worth spending the extra money. Many companies are offering smart thermostats for consumers to upgrade their homes heating or cooling systems. This picture is a generic thermostat. We are not promoting any particular type. We just used this picture as part of our post about a guide to smarter heating of your home. When it comes to smart thermostats there are several basic requirements that consumers need to consider. These include – basic functionality, learning capabilities relative to heating needs, internet connection via WiFi in your home. Most of all the ability to observe and also control the temperature in your home remotely. The basic objective is to reduce your heating costs and also ensure your home is comfortable. Remote control and internet connections are nice to haves, but you really need to evaluate whether you will use these features or not. A smart thermostat will have multiple time controls for various times of the day and will sense your schedule though manual adjustments that you make to the thermostat. Over time it will learn your schedule and heat your home accordingly. If you do not have WiFi or if you do not have a smart phone, it is unlikely that this feature will be of much use to you. Of course you can use your PC to observe and / or make adjustments, but most people want to be able to make adjustments on the go and a smart phone with internet data connections is often the best way to accomplish this. Before you pay extra for a smart thermostat, evaluate your planned use of the features available. A thermostat will less functionality and lower cost might still deliver the savings you are looking for. Consumers are asking the question, “How much do intelligent home electronics really save you?”. With all of the expenses today associated with running a home, any time someone suggests that they can save you money most consumers listen. However they quickly become disenchanted. Especially when they find out that the technology costs hundreds of dollars to implement with only minimal savings. In addition many are finding that just like computers, the life span is short. Because something new and better often comes along. How much do intelligent home electronics really save you? Intelligent home electronics fall into various categories with various combinations of energy reduction capabilities, convenience and security. Utility companies want to install intelligent meters to reduce the number of people who must read meters every month. They can also provide more information in real time to the customer. While it is a difficult sale for many, there are real savings for the utility. However it is unclear if these savings will be passed along to the customer. Other technologies that turn lights on an off. they Also anticipate when you arrive home and allow remote control over things like door locks, heating systems and lights. There is a combination of convenience, energy savings and security advantages. While you most like will not achieve sufficient savings to cover the cost of the technology, the increased level of convenience and security may be worth much more to the individual. We suggest that every consumer evaluate the overall costs, the savings capability, the convenience provided and the increased security that may come along with some of the electronic implementation. We have all of the buzzwords for this topic, “home convenience smart home DIY automated systems for consumers”. But the real question is, are consumers ready to pay for home automation that is really just in its infancy? Prices are high and functionality is just beginning to mature. Do you wait until prices come down a bit and the systems get smarter and easier to install? Thousands of dollars can be spent on remote controlled door locks, camera systems and more. Should the consumer invest now or wait? Take camera security systems for example. For approximately $500, you can purchase a system that records motion sensitive triggered activity on a hard drive which can be played back for later review. It only records when there is some kind of motion, an intruder or a squirrel. This system records day and night. It can send emails to alert you or the central monitoring station that you have a contract with. Do you want somebody on the other end monitoring you in your home or only when it is triggered. What are the privacy issues here. Then you have to install it. For those that are into DIY, physically the cameras are easy to install as long is there is an electrical plug near by and you have WiFi installed in your home. Otherwise you will need to run cables all over the place which makes an unpleasant mess. Automated door locks are a favorite application shown on the commercials. Power installed to the door so that the solenoid installed in the door will operate when it receives a signal over the WiFi connection is a must. Unless you plan a total rewiring of your home, or install the wiring in a new home as it is being built, home automation for the average consumer is a ways off just yet. We will be writing more about this subject in the coming months. Until recently, the notion that we could live in a totally automated house seemed like something out of the future. But today, home automation is becoming more and more popular, indicating that it is now a possibility. New home builders are beginning to add some of the features to their homes and many home owners are adding various automation abilities to their homes. Many are focused on improving security while other consumers are looking for comfort and control over their homes. Save money – Even if there is a cost associated with installing an automated system, doing so can lead to savings down the road. An automated house improves the efficiency of the home heating system. With one touch you can shut off all the lights in the house, as well as remotely shut the lights off if you forgot to before you left for the day. Control house temperature and adjust lighting more easily. Optimize management of home security systems (theft, fire and water damage). It started with movement detectors and fire alarms. Today it is much more than that and will continue to expand. These are the applications that are becoming more popular. Automatically shuts off the furnace when a window is open. Programs the heating and air conditioning systems based on the temperature outdoors. Automatically shuts off lights when the room is empty. Detect water leaks and automatically shuts the water valve off. Turn a tap on when a hand is placed under it and off when removed. Activate an automatic blocking system if the sewer backs up. Detect smoke and heat in case of fire. Detect if water pipes are at risk of freezing up. Alarm system can be set to present or absent mode (present mode: all lights turn on if there is abnormal movement in the home; absent mode: no light will turn on).